On a two-node Windows Failover Cluster, I have two SQL instances installed. Each instance runs on its own node in the cluster, so that it can make maximum use of the available memory on that server. However, when a failover occurs, it is necessary to reduce the maximum server memory setting for both instances, so that they can share the available memory on the one server. Rather than have to do that manually, however, I decided to automate the process using PowerShell and the Windows Task Scheduler, and here’s how. Note: the script will work for two SQL instances in a cluster. For additional instances, the script will need to be updated accordingly. Save the PowerShell script (download from Technet Gallery) to each server in the cluster. Update the PowerShell script setting the required variables in the parameters section, such as the log file location, the SQL instance names, the SQL service names, the path to the SQL SMO dll, the maximum server memory limit you want to set, and the timeout period. Create a scheduled task on each server, running as an account that has the appropriate permissions on each instance. 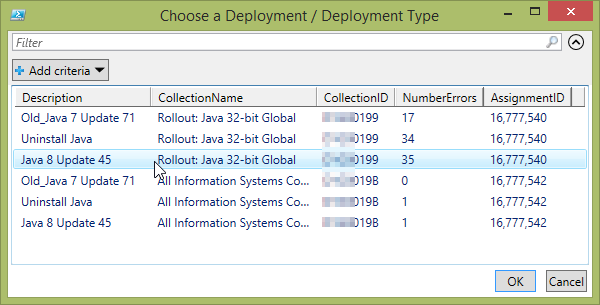 Add 2 triggers – one for each SQL instance – and use the event trigger. You can use event ID 101, for example, to identify when a SQL instance becomes active on that node. As the source, use the “SQLAgent$<instancename>”. When a SQL instance fails over to the other node, the script will be triggered and will set the maximum server memory limit for both instances on that node. 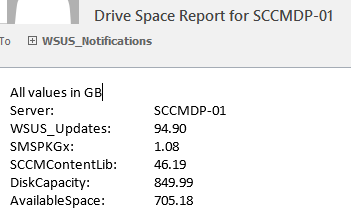 Recently I noticed that the available disk space on my ConfigMgr distribution points was getting low. 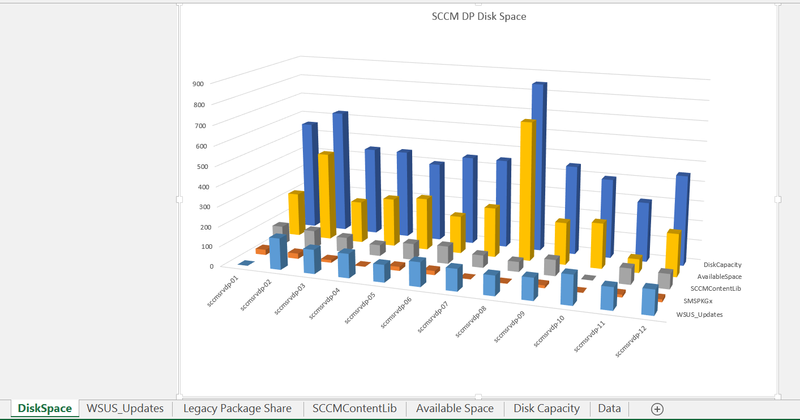 Since they are mostly VMs using SAN storage it’s fairly easy to increase the disk space, but it got me thinking about how I could monitor the DPs for available free space, as well as the sizes of the key directories that ConfigMgr is using to store large amounts of data, including the SCCMContentLib, the legacy package share (SMSPKGx$), and in my case, the WSUSUpdates folder, as I also use our DPs as WSUS servers for patching during OSD. These directories will certainly increase in size over time, as new content is distributed and new patches are downloaded. 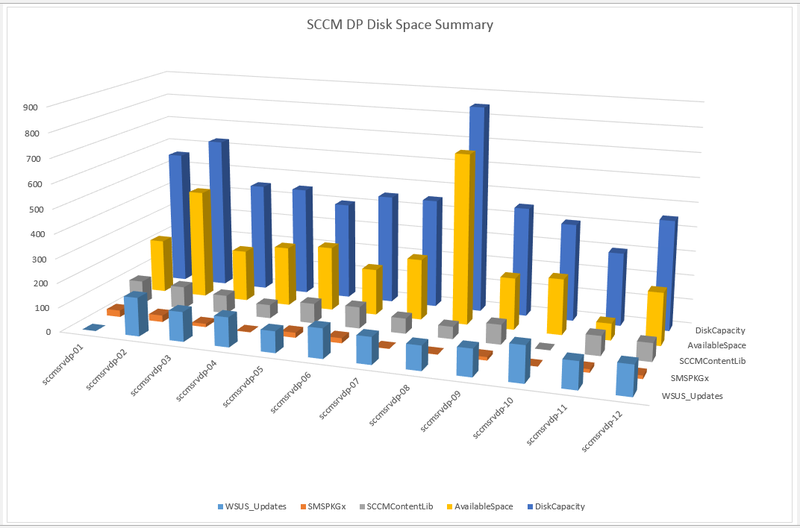 There are, of course, many ways to monitor the overall free disk space, including WMI, SNMP, various 3rd party software, your corporate monitoring tool and even ConfigMgr itself. 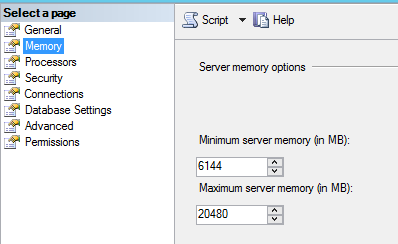 But monitoring the ConfigMgr/WSUS directory sizes can be a little trickier. Rather than purchase some new software to do it, I wanted to build a ‘free’ solution using tools already available to me in the Enterprise. I also wanted to have all this data for all our distributions points displayed graphically in a report. Since Microsoft Excel is my favourite reporting tool, I decided to build a workbook that has a data connection to a SQL database where I will store the disk and directory information from the DPs. Then I run a PowerShell script on each of the DPs as a scheduled task that will get the information I need and insert it into the SQL database. The result is a nice graphical report that displays all the data I want and keeps itself up-to-date automatically. You can download a sample report here. Here is a step-by-step guide to create such a report. First, we will create an SQL database where we will store this data. You could, of course, use an existing database as we only need a single table to store this data, but just for good organisation I will create a new one for this purpose. Here is a sql script that will create the database, create a table, and create records for each of my distribution points with blank data values for now. Edit the script with the hostnames of your distribution points, and run the script in your SQL instance. I recommend to create an SQL login to the database you created that has only ‘db_datareader’ permission. This way you can include the credentials required to get data from the database in the report, and not have to give SQL database permissions to everyone you want to share the report with. If your SQL Instance is not using Mixed-mode authentication, you can easily change this. I created a SQL login called ‘ConfigMgrDB_Read’ for this purpose (I use the same login to access my ConfigMgr database for reporting purposes). 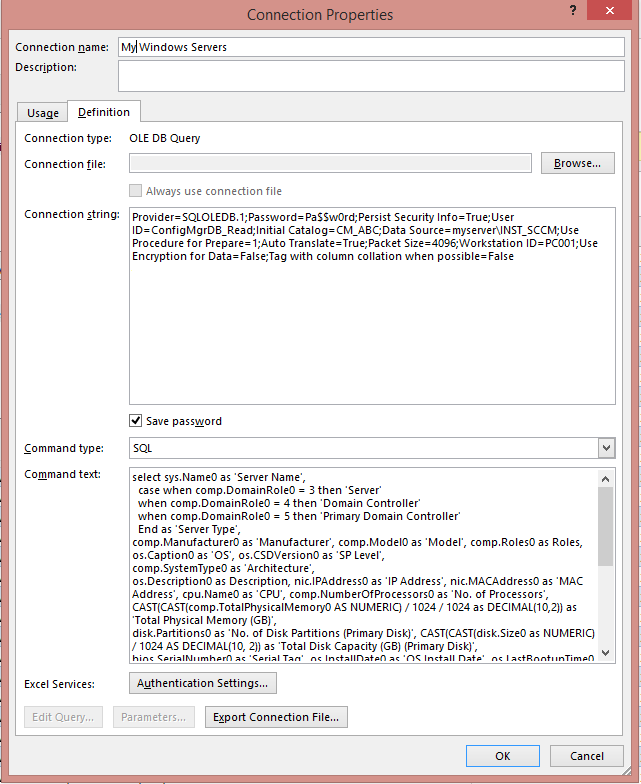 Note: The SQL credentials will be stored in clear text in the Excel data connection file, but since they are read-only permission, it shouldn’t be a security concern. 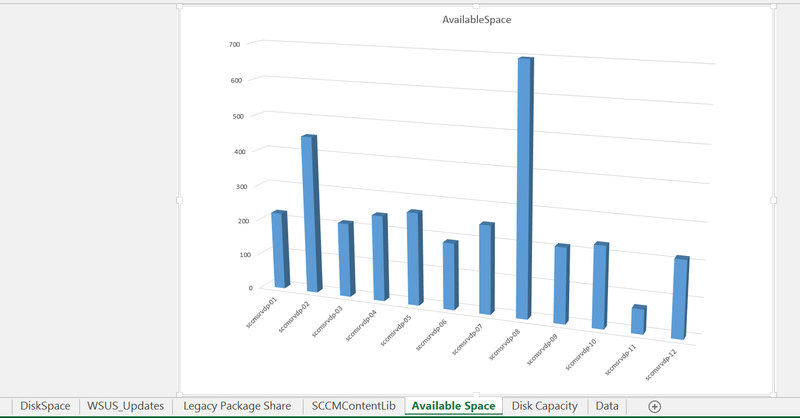 We will also get the disk capacity and amount of free space remaining. We will put this data into a simple formatted text table that can be sent in an email. We will then create a connection to the SQL database where we will store this data, and update the records with the new data values. I recommend to run this script as a scheduled task on each DP, rather than running it against multiple DPs from one location, especially if your DPs are across a WAN, as the Get-ChildItem commands run much quicker locally than remotely. The account running this script must have permission to input data to the SQL database. $messageSubject = "Drive Space Report for $ComputerName"
$table = "All values in GB`nServer:`t`t`t$systemname`nWSUS_Updates:`t$WSUS_Updates`nSMSPKGx:`t`t$SMSPKGG`nSCCMContentLib:`t$SCCMContentLib`nDiskCapacity:`t`t$capacity`nAvailableSpace:`t`t$freespace"
$update = "UPDATE DiskSpace SET WSUS_Updates = '$WSUS_Updates', SMSPKGx = '$SMSPKGG', SCCMContentLib = '$SCCMContentLib', DiskCapacity = '$capacity', AvailableSpace = '$freespace' WHERE SERVER = '$ComputerName'"
Note: if you don’t want to receive the email from each DP, simply put ‘No’ in the $SendEmail variable, although it’s a useful way to verify that the Scheduled Task has run. 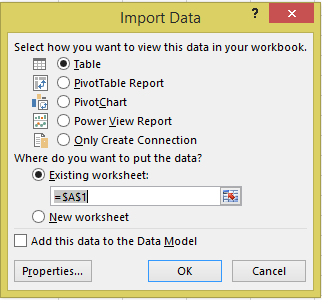 Open a new blank workbook in Microsoft Excel (I’m using Office 2013), right-click the tab for Sheet1 and rename it Data. On the Data ribbon, in the Get External Data section, click From Other Sources and choose From SQL Server. 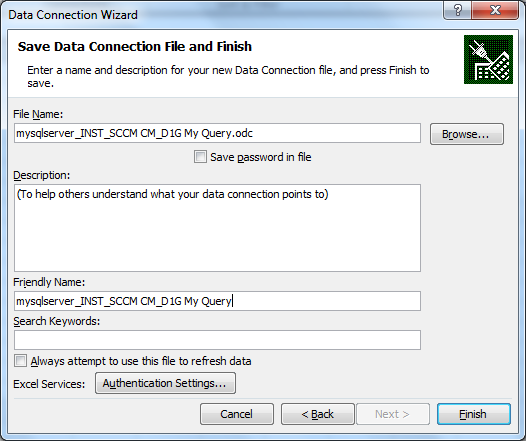 In the Data Connection Wizard, enter the name of the Instance that contains your database, and enter the SQL account credentials. Click Next. Select the SCCM_Server_Data database from the drop-down list, then simply click next. 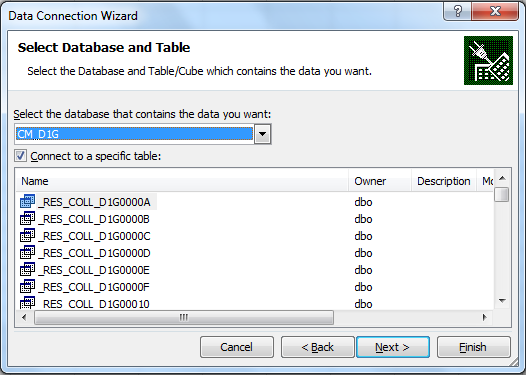 The database only contains one table, and we will pull the entire table into the workbook, so no need for a specific SQL query. 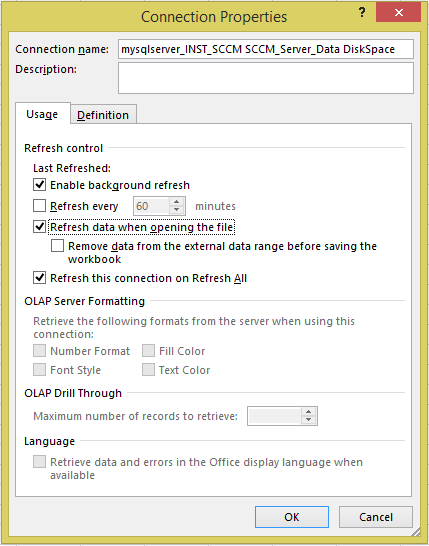 Rename the File Name and Friendly Name of the data connection file if you wish, then click Finish. 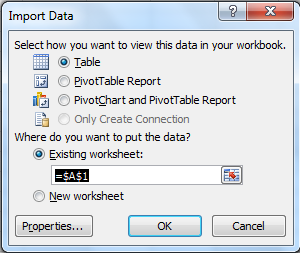 In the Import Data window, make sure to choose Table and the cell range =$A$1 in the existing worksheet, then click Ok. Finally, go to the Data ribbon again and click Connections. Make sure your data connection is selected, the click Properties. 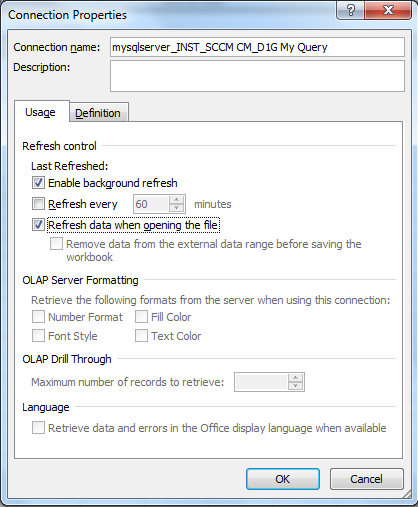 Check the option to Refresh data when opening the file. This will make sure that you always get the current data from the database every time the file is opened. On the Definition tab, check the box Save password, click Yes at the prompt to save without encryption, then click OK to save and close the Connection Properties. 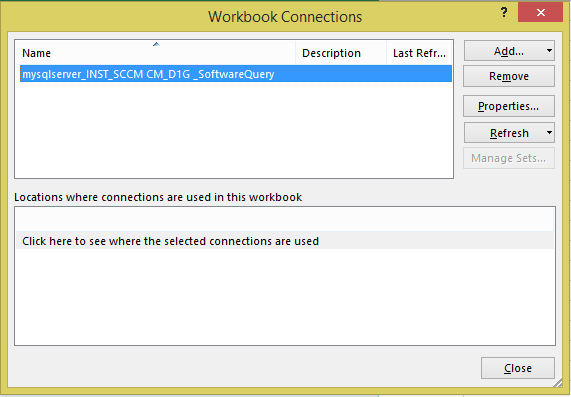 Close the Workbook Connections window. Now that we have the data, let’s create some nice charts to display it. First, select all the populated cells in the Data sheet, except for the ‘ID’ column, then right-click the Data tab and choose Insert… Choose Chart and click Ok.
Rename the Chart tab to Disk Space Summary. 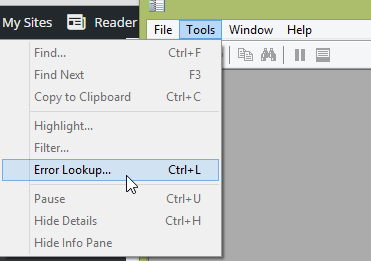 Click on the Chart, then choose Change Chart Type from the Chart ribbon. In the Column charts, select 3D Column and click Ok. Cool, looking better to my eye. Now let’s create some additional charts so we can compare the data on their own scales. Go back to the Data sheet and select all the populated cells in the Server column, and all the populated cells in the WSUSUpdates column, including the headers. 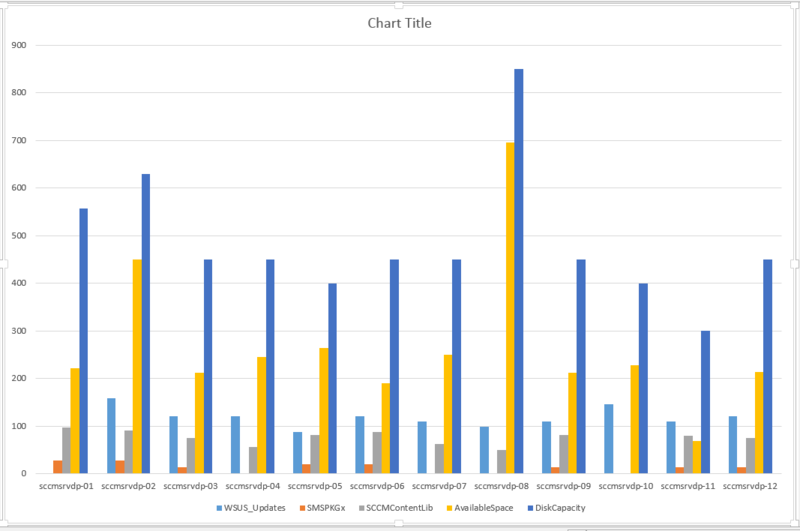 Right-click on the Data tab and choose Insert… Choose Chart and click Ok. Change the chart type again, this time choosing 3D Clustered Column. 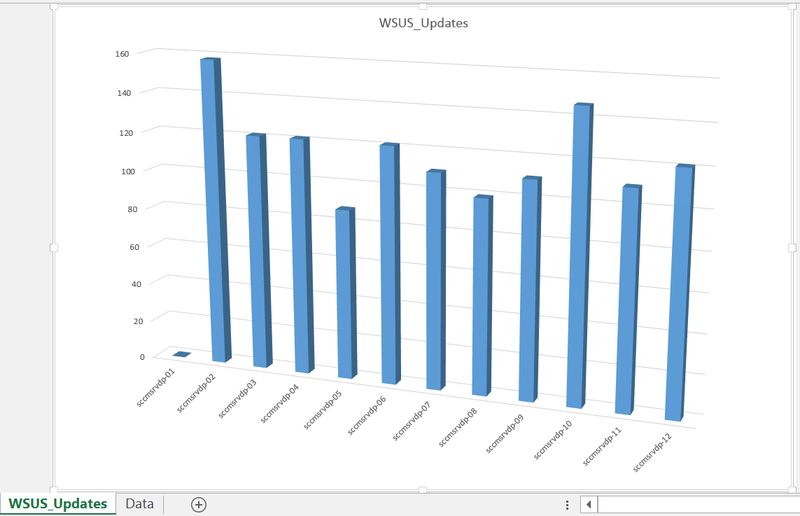 Rename the chart tab to WSUSUpdates. Now do the same for each of the remaining data columns in the Data sheet, selecting the populated cells in the Server column, and the next data column, and adding charts. There you have it. 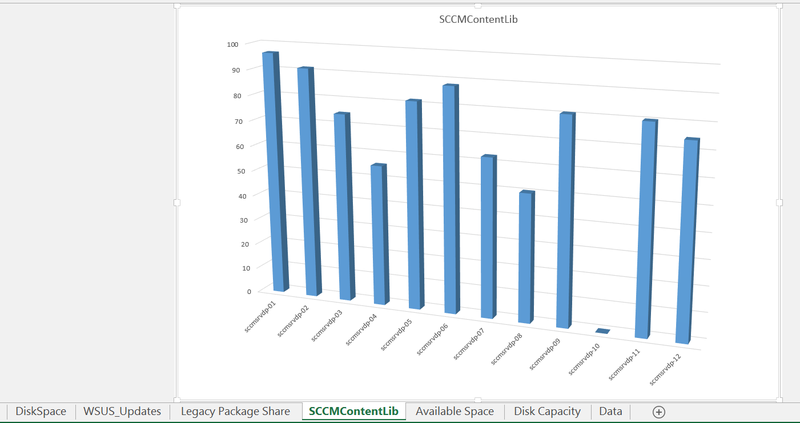 Now you can keep your eye on those SCCM DPs, know the sizes of the key content directories, observe how they are growing over time, and make sure there is plenty of free disk space available! Note: you could also create an SSRS report, if you prefer, with the SQL data and add the report to your existing ConfigMgr reports folder. If you want the most up-to-date data in your report, then you can manually trigger all the scheduled tasks to run immediately using PowerShell. If you have PowerShell remoting available, you can run the following script which will trigger the Task on all your distribution points. You need to enter your DP names in the $server variable, and it assumes that your scheduled tasks all have the same name on each DP. 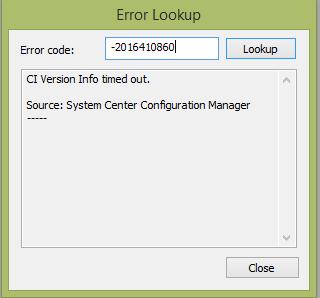 write-host "Trigger the DriveSpaceReport Scheduled Task on all DPs"
write-host "Last Run Time: $LastRunTime"
In setting up our SCCM 2012 infrastructure, I decided to patch our OS deployments using WSUS instead of SCCM Software Updates. Since we have multiple distribution points in different geographical areas, I decided to install a WSUS server in each location where we do deployments. Granted, installing and configuring WSUS is not the most technically challenging thing in the world, but when you have to do it multiple times, it begs for automation! So I fired up my trusty Powershell ISE to see what could be done. I wrote this script for my own environment, but it should be flexible enough to be used by anyone. 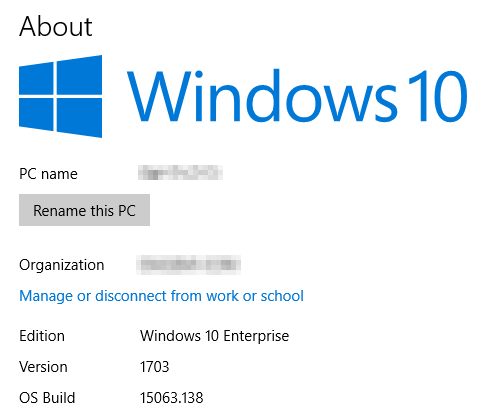 It’s tested for use on Windows Server 2012 R2 and It’s designed to run in Powershell ISE, so it doesn’t take any parameters, just set the variables as required. Also you can change any of the WSUS configuration, such as Products and Classifications, just edit the relevant section of the script. First, we install .Net Framework 3.5 if it isn’t already installed, this is a requirement for WSUS. 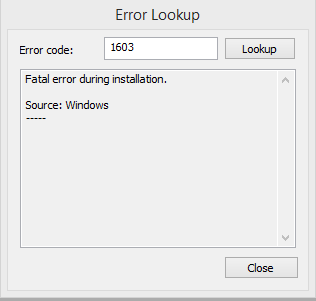 Next, we download and install Microsoft Report Viewer 2008 SP1, which is required for viewing WSUS reports. If you chose the ‘SQLExpress’ installation, we download SQL Server 2012 Express SP1 with tools and run an unattended installation using default parameters. Then we install WSUS and run the post-installation tasks with wsusutil.exe. 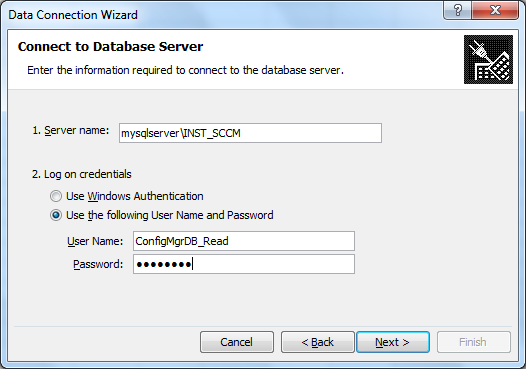 Now, we do a basic configuration, which is equivalent to running the WSUS Configuration Wizard. We set the location to sync updates from, the update language/s, run a metadata sync to get available Products and Classifications, set which Products and Classifications we want to sync, and enable the automatic sync schedule. Then we do a full sync. Once the sync is completed, we decline certain updates that we don’t want, such as all ‘itanium’ updates, configure and enable the Default Automatic Approval Rule, then run it so the updates will start downloading. Most of these activities are optional and are activated using variables which you must set before you run the script, so if you want to use WID, or an existing SQL instance you can. You can skip the configuration entirely and do it manually, or just do the bare minimum, and of course you can customise the configuration in the script. 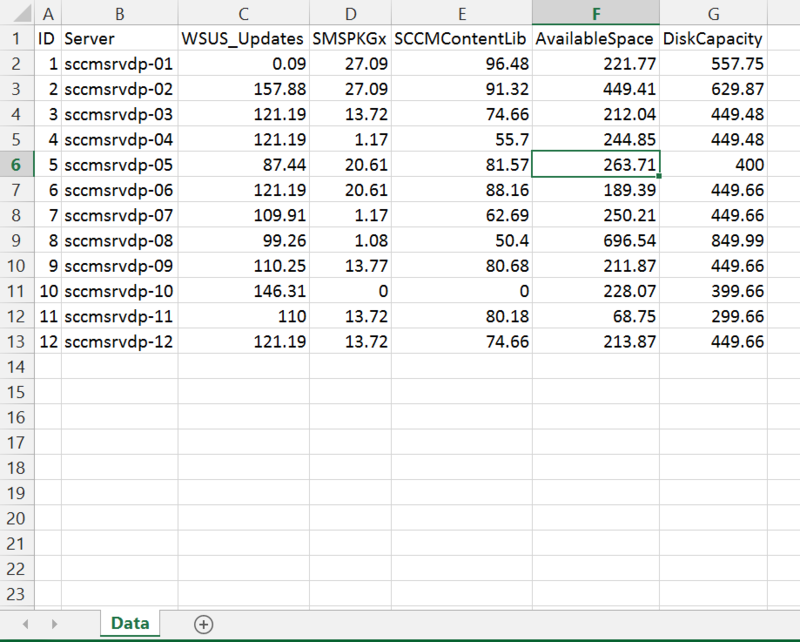 First, we set the variables, such as the WSUS installation type, the location for Updates, things to configure etc. # Do you want to download and install MS Report Viewer 2008 SP1 (required for WSUS Reports)? # WSUS Installation Type. Enter "WID" (for WIndows Internal Database), "SQLExpress" (to download and install a local SQLExpress), or "SQLRemote" (for an existing SQL Instance). # Do you want to configure WSUS (equivalent of WSUS Configuration Wizard, plus some additional options)? If $false, no further variables apply. # You can customise the configurations, such as Products and Classifications etc, in the "Begin Initial Configuration of WSUS" section of the script. # Do you want to decline some unwanted updates? 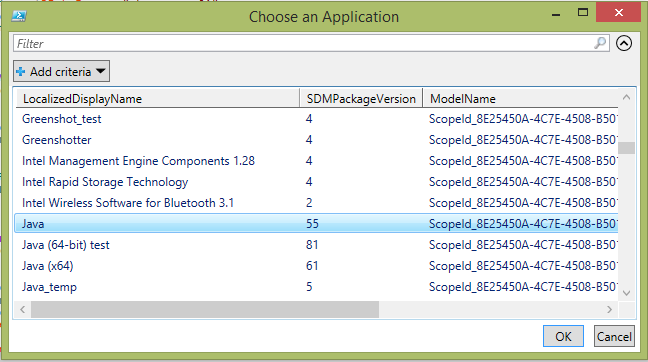 # Do you want to configure and enable the Default Approval Rule? # Do you want to run the Default Approval Rule after configuring? We install the Report Viewer from Microsoft for viewing WSUS reports. We start a bits job to download it, the we do a silent install. write-host "Downloading Microsoft Report Viewer 2008 SP1...please wait"
I prefer to use WSUS with a local SQL Express installation so I have some access to the database if I need to. 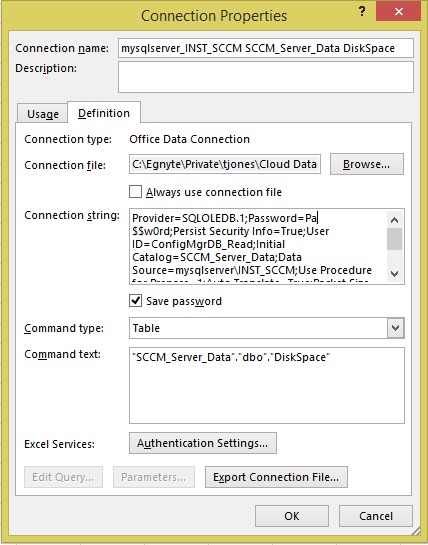 If chosen, we download and install SQL Server Express 2012 SP1 with admin tools using an unattended installation. We use the ‘ALLFEATURES_WITHDEFAULTS’ role, and add the local administrators group to the SQL sysadmin accounts. write-host "Downloading SQL 2012 Express SP1 with Tools...please wait"
Now we begin to configure WSUS. We connect to the WSUS server and get the configuration. We tell it to sync from Microsoft Update, then set the updates language to English. We tell WSUS which Products we want to sync. It’s very important to get these right, otherwise you will download a lot of updates that you don’t need and fill up your disk space! Obviously you’ll want to customise these for your environment. I guess it’s a bug, but it seems WSUS sometimes enables the entire parent Product when adding them by script this way, so we pause the script and prompt to check in the WSUS console that the correct Products are selected before continuing. $Shell = New-Object -ComObject "WScript.Shell"
We set the automatic sync schedule to once per day at midnight, then start the first full synchronisation. We monitor the progress of the sync in the Powershell console as it can take some time. After the sync is complete, we decline some updates that we don’t want. In my example, we are declining IE10 and the Microsoft Browser Choice EU updates, which we don’t want (I used the KB article number in the ‘TextIncludes’ parameter to find them), then we decline all ‘itanium’ updates because we don’t have any itanium servers. Do you? Then we enable the Default Automatic Approval Rule and configure it with the classifications we want. Finally we run the rule which will approve the updates and begin the file downloads. However, in my testing this always errors with a timeout when activated through Powershell, so I put it in a try-catch-finally block to finish the script successfully. 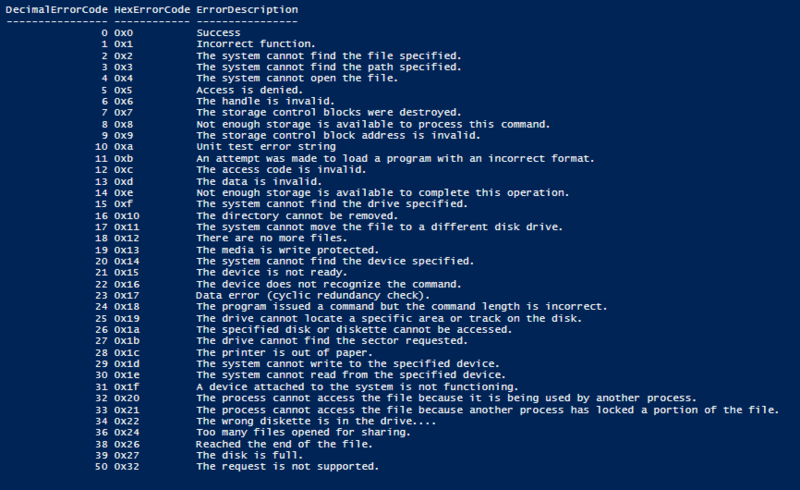 Even if it errors, the rule is actually run as you will be able to see from the WSUS console. After the Default Approval Rule has been run, you can monitor the ‘Download Status’ of the update files in the WSUS console. But since it can take a long time, I wrote a little script that will monitor the downloads and email me once they have finished. It must be run as administrator on the WSUS server. This is because it tries to authenticate with its computer account. So you have to create a new Receive Connector in Exchange to allow relaying from anonymous users with TLS-authentication to work around the problem. Incidentally, you can’t really configure E-mail Notifications with Powershell as you must set the recipient email address for it to work, and this is a read-only property that Powershell can’t change, so better to do it manually. That’s it! Feel free to suggest some improvements, or take the code and make something better yourself!